The Francis family has a Mizzou pedigree. Tony and Barb are both University of Missouri graduates. Brant is a junior working toward a plant sciences degree and Britton was recently named the livestock judging coach and will be working on his master's. Aly will be a junior this fall at Paris High School. Pictured, left to right: Brant, Tony, Barb, Aly, Britton. Photo courtesy of the Francis family. Britton Francis was born and raised with black and gold in his blood. Britton has been working with livestock since he was 8 years old. He competed at the collegiate … Expand ▸Britton has been working with livestock since he was 8 years old. 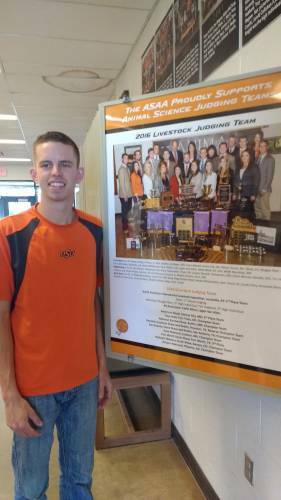 He competed at the collegiate level in livestock judging at Fort Scott Community College and Oklahoma State University. Photo courtesy of the Francis family. With a grandfather who was a professor of atmospheric sciences, parents who earned degrees from the University of Missouri and a brother currently earning a degree in plant sciences, the Francis family, who hail from Paris, Mo., has a Mizzou pedigree. Although Britton didn’t receive his bachelor’s degree from MU, he is officially joining the Mizzou College of Agriculture, Food and Natural Resources’ family in August. 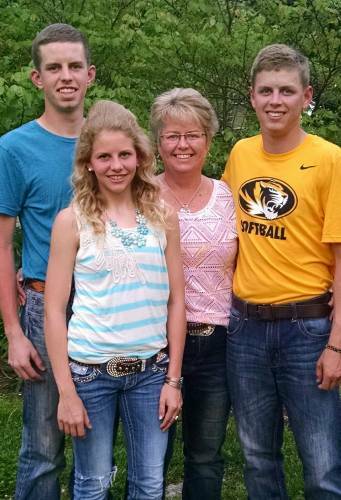 Britton will be working on his master’s degree in meat science, as well as coaching the livestock judging team. Britton has been working with livestock since was 8 years old. He competed at the state level for several years through 4-H and continued to compete when he entered high school. It was while he was judging livestock as a junior that another door opened – competing at the collegiate level. “During the short time judging in high school, our team became really good friends with the judging team from Eldon, as our advisors were best friends,” Britton said. “The year after state convention, Eldon’s advisor, Gary Reichel, contacted me and told me that one of his students, Joe Limbach, was looking into going to a junior college, and that I should start looking into judging collegiately as well. All three Francis children have grown up showing livestock through 4-H. Pictured here is Aly showing … Expand ▸All three Francis children have grown up showing livestock through 4-H. Pictured here is Aly showing sheep with Britton. Photo courtesy of the Francis family. 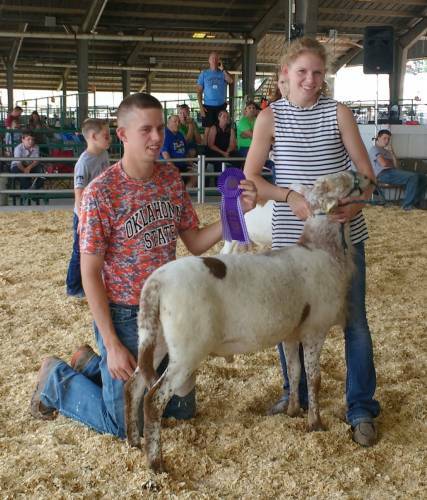 Britton spent two years at Fort Scott, competing in livestock judging in both years. He transferred to Oklahoma State University after that, continuing his judging journey. Britton also received his degree in animal science from OSU in May. A livestock judging team is made up of five members whose scores count toward the final point total. Each member of the team judges four livestock species – cattle, sheep, goats and hogs. After a year hiatus, the Mizzou livestock judging team will return this fall. Britton followed in his father’s footsteps in terms of degree, as Tony Francis earned an animal science degree from Mizzou in 1989. The Francis family has a passion for agriculture. Pictured, left to right: Britton, Aly, Barb, Brant. Photo courtesy of the Francis family. Tony sold animal pharmaceuticals in Iowa and worked for Farm Service Agency in St. Louis before returning to Monroe County. He has served as the Monroe County executive director with the United States Department of Agriculture’s Farm Service Agency since 1991. Tony also has served as the CAFNR Ag Alumni Association president. Britton’s mother, Barb, is a graduate of MU’s College of Human Environmental Sciences. Brant, Britton’s younger brother, is currently working toward his plant sciences degree with an emphasis in turf management. Brant was sold on attending Mizzou after meeting with Brad Fresenburg, MU Extension turfgrass specialist. With a passion for sports, Brant found a common link between sports and agriculture with turf. Brant is interning at The Ballpark of the Palm Beaches in West Palm Beach, Florida, this summer. This year the facility hosted its inaugural spring training season, welcoming the Houston Astros and the Washington Nationals. The Francis family raises cattle and sheep and spent many summers traveling for 4-H and FFA events. Those trips installed a passion for agriculture in both Britton and Brant. The two were involved in a lot of the same activities, as Britton is only 13 months older than Brant. The youngest Francis sibling, Aly, will be a junior at Paris High School in the fall. She is following in her brother’s footsteps thus far, competing in 4-H and FFA events. While she hasn’t made a college decision yet, she has several good references if she heads to Mizzou.